Ok, so the blog may be called (Mis)Adventures in Vegan Cooking, but I’m not always 100% Vegan. While I mostly maintain a vegan kitchen, I do have my occassional lacto-vegetarian moments. Sometimes, I’m cooking for carnivorous friends, which creates quite a quandary. On the one hand, I like to stick to my guns. However, on the other hand, when someone cooks for me or we go out to eat together, I expect my eating preferences to be equally weighted against theirs. I wouldn’t like it if I showed up at a friend’s house and was handed a steak, or showed up for a date only to be whisked away to a Churrasco restaurant. So this past weekend, I struck a happy medium and decided to share the recipe here anyway. I started off by doing a lot of research on enchilada sauces, mostly because I had no idea what went into one, just that it was spicy and delicious and red. As it turns out, you are supposed to use chicken broth, tomato paste, cumin, and chili powder. Other ingredients like garlic and oregano are optional. I switched out the chicken broth for veggie and I was in business. I also added a clove of garlic, because I love garlic and don’t think you can ever go wrong with it. Thus, we ended up with a fat-free, cruelty-free sauce that packs in a nice serving of vegetables. Then I started to think about the enchiladas themselves. I was pretty clear on the concept: tortillas + cheese + enchilada sauce. However, it didn’t feel like nearly enough vegetables. I read some recipes with spinach, but then came up with a very whimsical idea. I would add red and green peppers and onions to the middle of my enchiladas, thus creating fajita-style enchiladas. It was almost as earth-shattering a culinary moment as the pizza bagel, I am sure. If you wanted to, you could use any vegan cheese in place of the regular stuff, or I bet you could even blend together tofu and nutritional yeast, like in my vegan lasagna, and spread that over the tortillas instead. 1. In a medium saucepan, stir together flour and 3 tbsp. of the veggie broth and cook for about 2 minutes over medium heat, stirring occasionally. This is called a roux. 2. Add minced garlic and cook for 1 minute. I always like to give the garlic a chance to cook a little and bring out its flavor. 3. Add tomato paste and spices and mix well. 4. Stir in veggie broth and switch heat to medium high. Bring to a boil, then reduce heat and simmer for 15 minutes. Take my advice on this one and put a lid on the pan. My stove looks like a crime scene. 1. Heat olive oil in a large frying pan, add garlic and onions and cook until onions begin to brown. 2. Add sliced peppers and cook for 10 minutes over medium heat, stirring frequently. 3. While the peppers are cooking, place a stack of tortillas in a baking dish and pop it into a 350 degree oven. 4. When peppers are done, remove tortilla shells from the oven and prepare for assembly. 5. 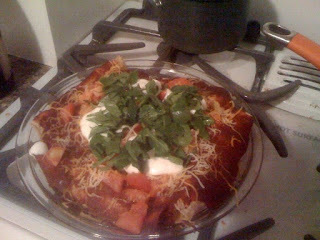 Cover the bottom of your baking dish with enchilada sauce. 6. For each enchilada, take the tortilla and sprinkle a little less than 1/4th of a cup of shredded cheese over it. Add 2 heaping tablespoons of your pepper mixture and roll it up. Place these, seam side down, in your baking dish. 7. Cover the enchiladas with the remaining sauce. 8. Bake at 350 degrees for 25 minutes. Sprinkle diced tomatoes over the dish and continue cooking for 5 minutes. Top with sour cream and spinach.